I know I am just an anonymous poster on reddit, I know I am nobody but I would first like to express my sincere condolences to the family of US Secret Service Agent Nole Edward Remagen who died while protecting the President of the United States in Scotland. His sacrifice to our Country will always be remembered, honored and dignified. that the paraglider was a Greenpeace operative and was 55. Two days later, Secret Service Remagen dies after suffering a severe stoke. Did you also notice Jeffrey Boyd had a 45 (9) with 2 (1+1) rounds hinting at the 9/11 false flag? Coincidence? I will show you it is not. Who are these people trying to assassinate our President, sending threats, cryptic messages on flying banners, mocking the death of a Secret Service Agent and using numbers and symbolism? I will show you who they are. We have seen in Scotland and in the rally the lower layers. Today I will show you the upper layers, the ones who really run the show, those JB himself takes his instructions from. But this information has a cost: I will need to show you first how their comms are structured. Are you ready for a deep dive in the enemy’s comms? I will make it as simple as possible, those among you who do not like numbers, please give it a try, you will see, it’s less complicated than having to verify your change at the grocery store. Seriously. Not kidding. Amazing stuff. Trump says “you know where I’m getting at, right?”. Do you know where he was getting at? Yes he repeated 17 several times in reference to Q, the 17th letter of the alphabet, and validated him yet another time. 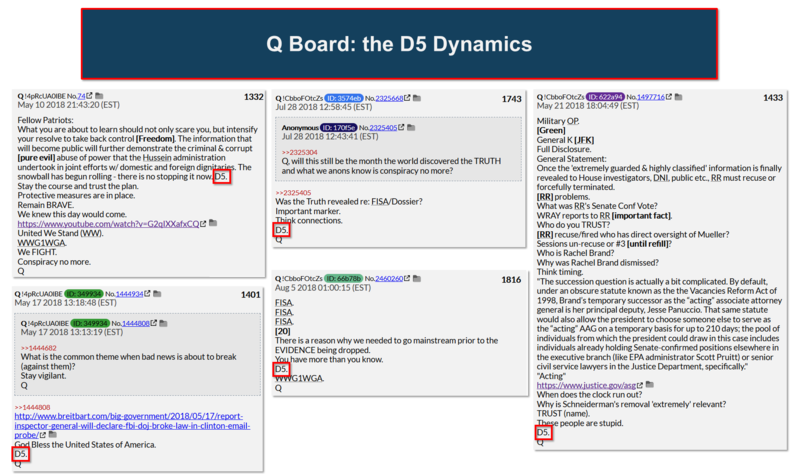 But beside the Q validation, do you know where POTUS was really getting at? What if I told you POTUS has given you in these 2 minutes a crash course to understand the comms?! He said in a “nonsensical” sentence trail, seeming to be all over the place: 17 (several times), overnight, Mike Pompeo (randomly), Pennsylvania Avenue (several times). Why does he repeat 17? Because he is giving a shout out to Q=17. Why does he insist on Pennsylvania Avenue? Because the initials are PA=P+A=16+1=17=Q, he is re-validating Q. Why 7 of the times he visited his hotel? Because the address of his hotel in DC is 1100 Pennsylvania Avenue. If you dismiss the repeated 1 and the zeros, you get “7 times visiting 1”, which is 17=Q again. Why does he randomly bring in “Mike Pompeo” after saying “overnight”? Because overnight=118 and Mike Pompeo=118. Now, a little more difficult: why did he pick 118 and not another number? Expand your thinking. Because -1+18=17. Again, he is validating Q. So everything Trump said was nothing but 17. 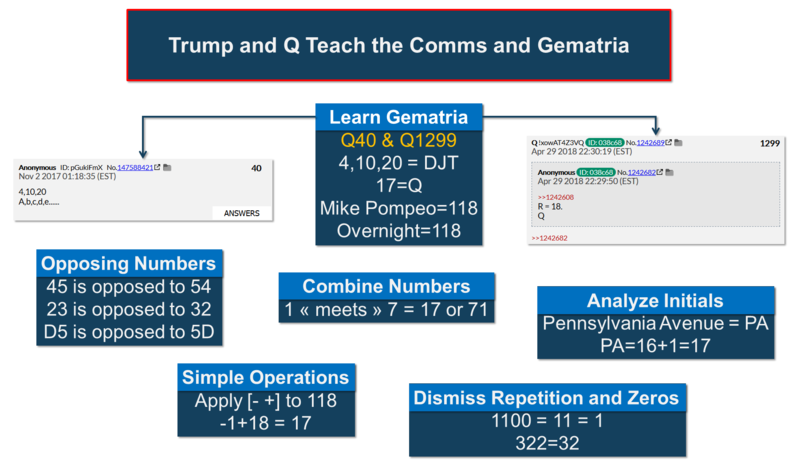 In these 2 minutes, Trump has given you examples of how Gematria can be used with initials, combining numbers, simple operations and erasing repetition to convey a message. 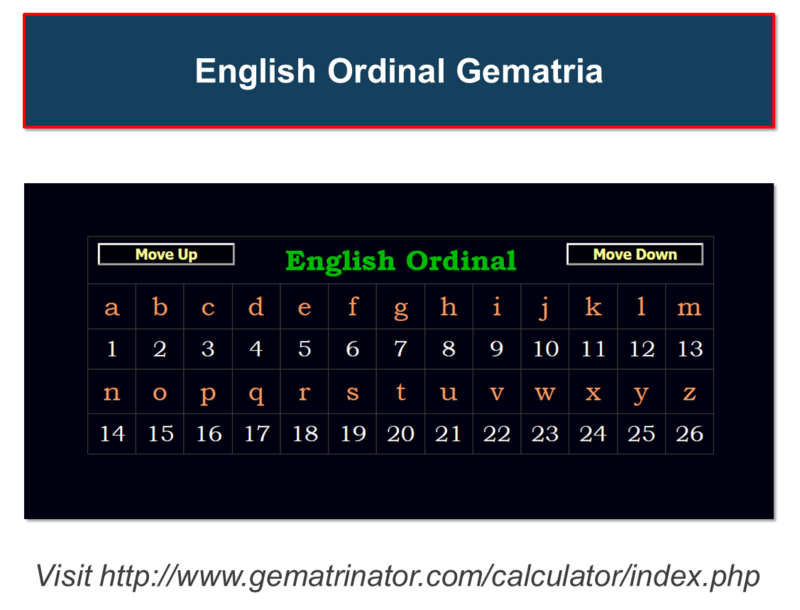 He is also validating Q’s introduction to Gematria in Q40. Now you are equipped to understand the paraglider’s message on the banner. It says: “Trump well below par #resist”. What is the Gematria of this message? Use the online tool link3. You get 322. What is 322? Yes, it’s the famous symbolic number of the Skull and Bones Secret Society. If you are not familiar with the Skull and Bones Secret Society, here is an excellent summarizing video. If you want to go further: Antony Sutton – The Order of Skull and Bones – Brotherhood of Death. You got it? 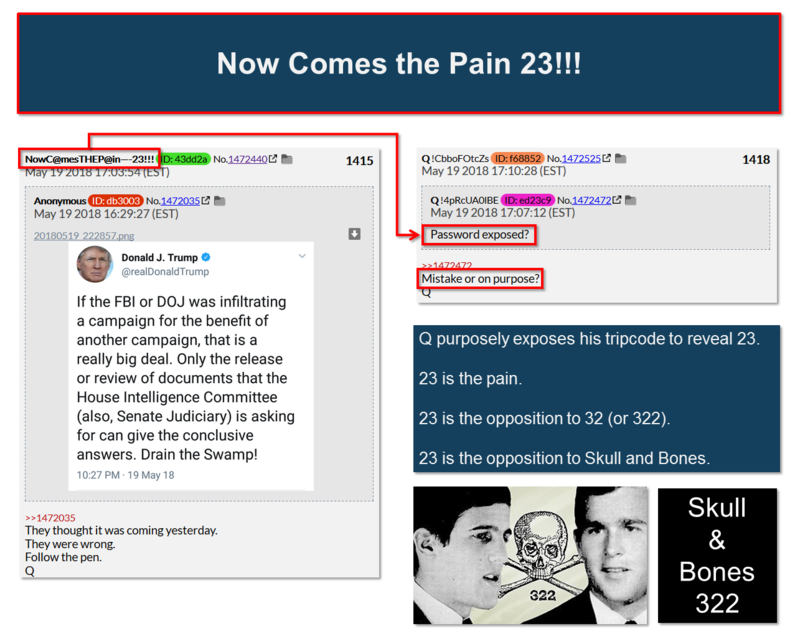 23 is the Trump and Q dynamics. 32 is the Skull and Bones dynamics. And they are at war. A silent war. A deadly war. Now that you know this amazing secret, you are equipped to understand what follows. Let’s revisit the Pledge to America’s Workers Event at the White House, watch until 14:23. Did you catch it? Why a pledge? 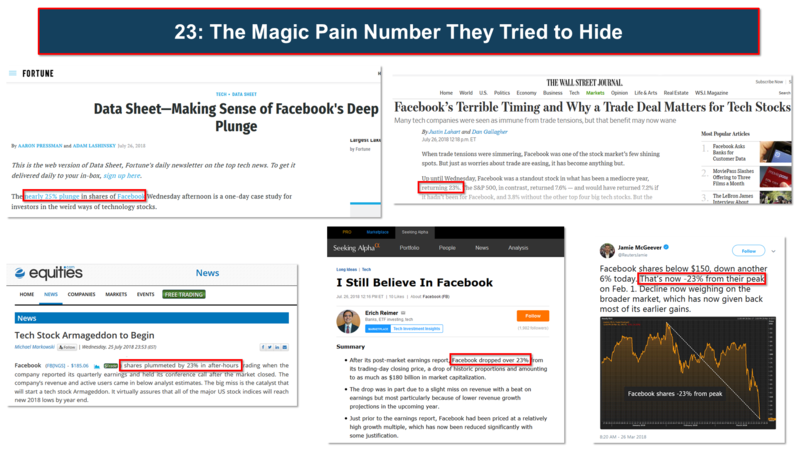 Why 23 companies? Why the Youth? Trump is showing his opposition to the 32/322 Skull and Bones dynamics which, through secret oaths planted in our youth, secret allegiances and buddy-buddy business have deprived our Country from its wealth to enrich a few selected people. 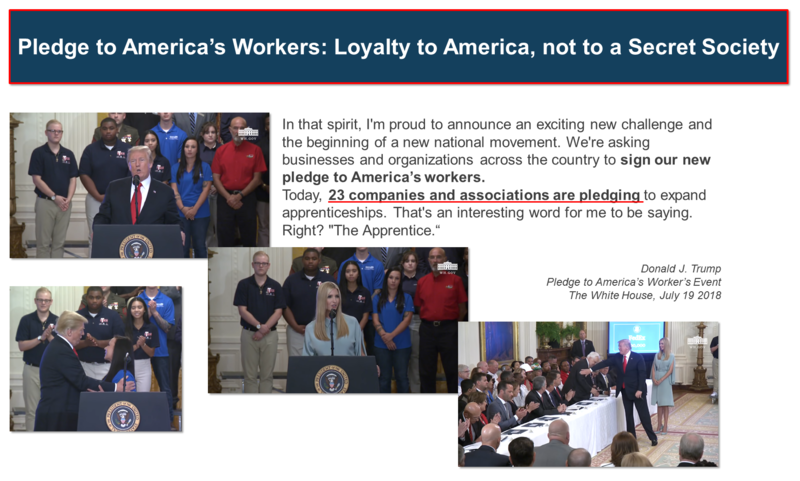 Through this pledge to American Workers, and the number 23, Trump is asking our Private Sector to show its loyalty to the People and to put an end to the Secret Societies vampirization of our economy. without Q being able to retaliate with real numbers, real money and real losses? 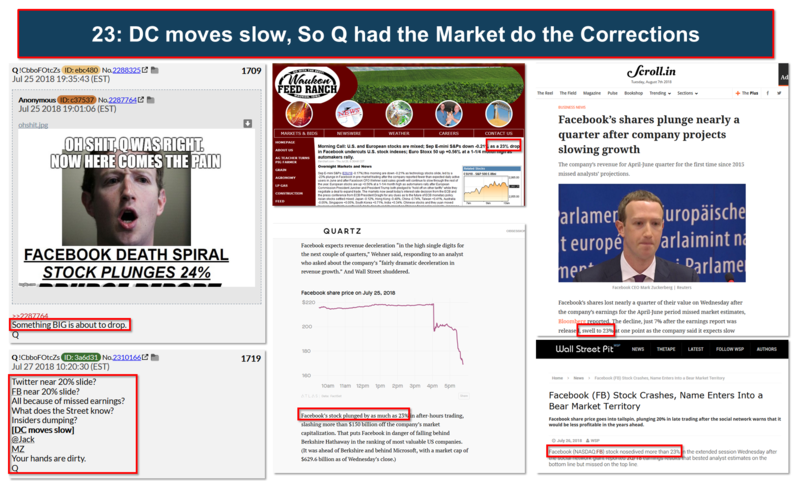 Q666 Stock market DIVE [666 – coincidence?]. Now you understand this war against Skull and Bones and similar entities is, for what physical eyes can see, primarily a financial war. To deconstruct their power that has evolved in our national and international political infrastructure, Trump knows it is necessary to attack the basis of their wealth: 1) perversion of our intellectual youth through Ivy League secret oaths and fraternities, 2) market manipulations causing artificial stock values and ultimately the creation of fake billionaires. They will never tell you this in school. Why? Because they control the Education System. Would they tell you about their crimes? Q189 All that you know to be right is wrong. The ‘cult’ runs the world. Fantasy land. This is what they tell you in school: Germany was destroyed after WW1 and their economy in pieces, Germans would hardly find anything to eat. Then, 15 years later, a guy named Hitler comes from nowhere and creates from these ashes the relatively most powerful military and industrial complex in human history that will later shake the whole planet. Oh Yeah? How? If this was real, shouldn’t this success story taught in schools and replicated? Where did he get the raw material? The fuel? The money? The intelligence? Why am I telling you all this? It’s because I want you to know why they killed Trump’s Secret Service Agent Remagen in Scotland. Did you know one of the main battles that changed the course of WW2 was a battle called the Battle of Remagen? Coincidence?